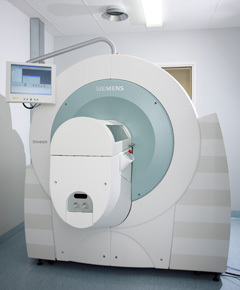 The Inveon PET/CT system (Siemens Medical Solutions, Knoxville, TX, USA) is a high-resolution small-animal imaging system with single (PET or CT) or multimodality (fused PET+CT) imaging. Both systems can be operated independently or as a single unit under the control of a single workstation. The spatial resolution of the PET system is approximately 1.4 mm. The transaxial field-of-view (FOV) of the scanner is 10 cm and axial FOV is 12.7 cm, and continuous bed motion effectively extends the axial FOV up to 50 cm. The bore diameter is 12 cm, which means that only 1-2 animals can be imaged at one session. With the X-ray source, the Inveon small-animal CT delivers in vivo resolution as low as 30 microns and require app. 10-20 min per animal. As with radiographic imaging generally, bone-soft tissue, and lung-soft tissue contrasts are excellent but soft contrast-soft tissue contrast is poor without intravenous contrast agents. The equipment includes an isoflurane anesthesia system designed for small animals as well as physiological monitoring system including respiration, temperature, and ECG monitoring during imaging.